Downloading a film and sharing or streaming content is about to become faster and more reliable for nearly 6000 homes and businesses in Bargoed. People living in the Rhymney Valley town are set to benefit from access to some of the fastest broadband speeds available (up to 330 Mbps), providing enough bandwidth for a family of four to all stream ultra HD or 4k quality movies or TV simultaneously. “We are delighted to be upgrading our network and extending our ultrafast broadband reach to dozens of new locations across the UK, benefitting hundreds of thousands more homes and businesses. The amount people are doing online, often at the same time, is growing every year and the pace shows no sign of slowing. We understand people need to have a fast and reliable connection at home and at work, and our ultrafast broadband network is at the forefront of making that happen. Nearly 27.6 million homes and businesses in the UK can already access Openreach’s fibre network. And with a wide choice of service providers, people are free to choose the best internet package for them. This latest work in Bargoed uses a technology called Gfast, which builds on existing infrastructure, changing the way broadband signals are transmitted to make them ultrafast without the need to dig up roads and install new cabling all the way to the property. 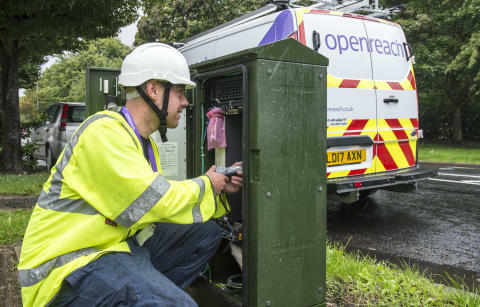 The rollout will see Openreach engineers building on the existing high speed broadband network across the county where more than 98 per cent of homes and businesses already have access to superfast (speeds of 30Mbps and above) broadband. With superfast broadband, things like uploading and downloading music, films and photos all happen quickly and it’s great for studying or working from home. Across Wales , more than 1,800 people are employed by Openreach, most of them engineers. And that team is expanding, after it was announced earlier this year that more than 250 new engineers are being recruited throughout the country to help with the ultrafast broadband rollout.